I've had the color orange on my mind lately - probably because I've been watching the newest season of Orange is the New Black and trying not to race through the episodes too quickly. While I think it's a great show, it's not very appropriate for Feel Good Friday. 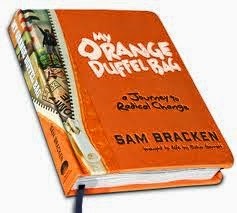 Founded in 2010 by Sam Bracken, he was inspired by his own experience which he describes in this CNN interview as "Being raised like a whacked out version of the Brady Bunch on an episode of Cops." Yikes. 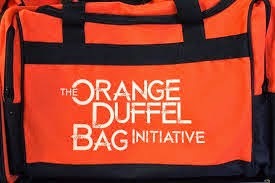 There was a point in his life when all of his belongings fit into an orange duffel bag and that became the title of the book in which he shares his life story, as well as the name of the foundation. As stated on their website, "ODB’s focus: To provide life plan coaching via certified life and executive coaches to at-risk youth, award ODB graduates a laptop computer to bridge the digital divide, and provide ongoing advocacy and to raise awareness about the barriers at-risk youth face in their quest to become self-sufficient." They have a coaching program to help high school students who are homeless or in foster care to complete their educations, as well as a program focused on coaching for college completion. You can get more details by watching this 4 minute PSA, listening to an NPR interview with an ODBI graduate or reading this article from the Christian Science Monitor.